Although many consider it to be the beginning of the American Revolution, few Americans are familiar with the conflict known as Lord Dunmore’s War. It featured one battle, the Battle of Point Pleasant, fought on October 10, 1774 at Point Pleasant, which is the confluence of the Kanawha and Ohio Rivers in modern-day West Virginia. This series of four blog posts will focus on Lord Dunmore’s War, and will place it in its proper historical context. 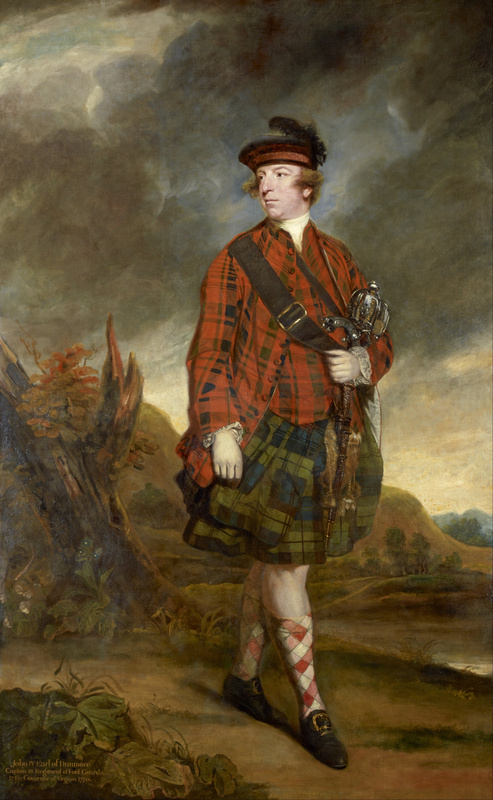 John Murray, a Scot who was the fourth Earl of Dunmore, commonly known as Lord Dunmore, was the final colonial governor of the Virginia colony. The conflict that became known as Lord Dunmore’s War was a dispute over who would control the area south of the Ohio River, known as the Ohio Country. The Iroquois Confederacy claimed that land, although other tribes, including the Shawnee, also hunted that land. Disputes over control of this area were among the primary triggers of the French & Indian War (otherwise known as the Seven Years’ War), which cost France control of the region. When the British claimed control over those lands at the end of the French & Indian War, the Indians refused to cede control of their hunting grounds, and prepared to defend them. The Shawnee were the most powerful of the tribes aligned against the Iroquois, and they organized a large confederacy of tribes opposed to the British and the Iroquois to defend their claims to the Ohio Country. British diplomacy largely isolated the Shawnee, and they soon stood largely alone against the British. Shortly after the treaty ending the French & Indian War, British settlers and surveyors pouted into the area, immediately bringing them into conflict with the Indians. As early as September 1773, Indians attacked white settled in Kentucky County, Virginia and captured and tortured to death Daniel Boone’s son James and another man. By December, word of this atrocity reached newspapers in Baltimore and Philadelphia. For the next several years, Indian raiding parties regularly attacked settlers, mutilated and tortured the men to death and enslaved their women and children. Capt. Michael Cresap established a trade post at Redstone Old Fort near present-day Brownsville, Pennsylvania on the Monongahela River. Under Lord Dunmore’s authority, Cresap seized control of land at and below the mouth of Middle Island Creek near present-day Sistersville, West Virginia. In the spring of 1774, he traveled there to settle his holdings. A second group, led by Ebenezer Zane, had established a settlement at the mouth of Sandy Creek, near present-day Ravenswood, West Virginia. A third, and larger, group that included the famous future explorer George Rogers Clark, settled at the mouth of the Kanawha River near modern-day Parkersburg, West Virginia. They were waiting there for other Virginians who intended to settle lands in Kentucky. Soon, word filtered in that hostile Indians regularly attacked, robbed and killed traders, surveyors and other travelers down the Ohio River. They soon concluded that the Shawnee and their allies were determined to go to war. Consequently, they decided on a preemptive strike: they would strike an Ohio Indian village called Horsehead Bottom near the mouth of the Scioto River at modern-day Portsmouth, Ohio. They chose Cresap, who had military experience, to lead this raiding party. Cresap talked them out of launching the attack on the Shawnee village because he did not believe that war was inevitable. If they carried out their attack, they would trigger an all-out war and would be blamed for it. He persuaded them to go to Zane’s settlement (present-day Wheeling, West Virginia) wait and see what would happen. However, tales of savagery by the Indians riled up the countryside, and the ranks swelled with men itching to attack the Shawnee. Capt. John Connolly, the garrison commander at Fort Pitt sent word to Zane’s settlement to wait for a few days because he had sent messages to the local tribes to determine their intentions. Connolly soon sent a message indicating that the Shawnee and their allies intended war. On April 28, 1774, Cresap convened a meeting where he read Connolly’s letter to the assembled group, which then declared war against the Indians. On April 29, settlers spotted Indian canoes on the river and chased them about fifteen miles downriver to Pipe Creek, where they attacked the Indians. A skirmish occurred, with both sides taking a few casualties. On April 30, Clark’s party abandoned its plan to go to Kentucky, broke camp, and joined Cresa’s men at Redstone Old Fort. Immediately after the Pipe Creek attack, settlers attacked and killed relatives of the Mingo leader, Logan at their camp on the west bank of the Ohio River at Yellow Creek, near present-day Steubenville, Ohio. Until that moment, Logan had not indicated any intention to go to war. A party of about 30 Mingos, including Logan’s younger brother, known as John Petty and two related women (including one who was pregnant and an infant), crossed the Ohio and visited the cabin of a settler named Joshua Baker. A group of 30 frontiersmen suddenly barged into Baker’s cabin and killed all of the Mingos but the baby. Logan blamed Cresap for the attack, even though Cresap had nothing to do with it. Realizing that this would now rile up the Indians, most of the area’s settlers sought protection either in blockhouses, or by heading east across the Allegheny Mountains. They had good reason to be alarmed: the Mingos and Shawnee began striking settlers, seeking revenge. We have received your Speeches by White Eyes, and as to what Mr. Croghan and Mr. McKee says, we look upon it all to be lies, and perhaps what you say may be lies also, but as it is the first time you have spoke to us we listen to you, and expect that what we may hear from you will be more confined to truth than what we usually hear from the white people. It is you who are frequently passing up and down the Ohio, and making settlements upon it, and as you have informed as that your wise people have met together to consult upon this matter, we desire you to be strong and consider it well. Brethren: We see you speak to us at the head of your warriors, who you have collected together at sundry places upon this river, where we understand they are building forts, and as you have requested us to listen to you, we will do it, but in the same manner that you appear to speak to us. Our people at the Lower Towns have no Chiefs among them, but are all warriors, and are also preparing themselves to be in readiness, that they may be better able to hear what you have to say….You tell us not to take any notice of what your people have done to us; we desire you likewise not to take any notice of what our young men may now be doing, and as no doubt you can command your warriors when you desire them to listen to you, we have reason to expect that ours will take the same advice when we require it, that is, when we have heard from the Governour [sic] of Virginia. Responding to word that fighting had begun along the Ohio River, Lord Dunmore asked the Virginia legislature to authorize general militia forces and to fund a volunteer expedition to the Ohio River valley to quell these disturbances. He planned to march into the Ohio Valley and force the Indians to accept Ohio River boundary that had been negotiated with the Iroquois as part of the 1768 Treaty of Fort Stanwix, which ended the French and Indian War. Dunmore realized that this expedition presented a prime opportunity to open new lands to expansion of the Virginia colony, a policy he had pursued for years. Dunmore, who vehemently opposed the rebellion brewing in Massachusetts, recognized that this expedition could also help to divert the attention of the Virginia colonists from the crisis growing in Boston. He hoped that the Virginia citizenry would rally around his administration rather than joining the rebels in New England. He also hoped to secure Virginia’s claim to the area around Fort Pitt and also remove the threat of the Indian tribes opposed to the settlement of the Ohio Country and Kentucky. It was a bold gamble that could cost Dunmore his position as governor if it failed. A large force of Virginia militia mustered and advanced toward the Ohio River. Dunmore split his force into two groups: 1,700 men under Dunmore’s personal command that would move down the Ohio from Fort Pitt and another 800 men under command of Col. Andrew Lewis, which would travel from Camp Union (modern-day Lewisburg, West Virginia), which would rendezvous with Dunmore’s column near Point Pleasant at the mouth of the Kanawha River. Dunmore’s column arrived at Fort Fincastle—at modern-day Wheeling—on September 30, while Lewis’ column—now 1100 strong—arrived at the mouth of the Kanawha on October 6 after a grueling 19 day march through the mountainous wilderness. Lewis established Camp Pleasant there, and sent messengers up the Ohio River to find Dunmore. On October 9, Dunmore sent a dispatch announcing his plan to proceed to the Shawnee towns on the Scioto River, and ordered Lewis to cross the Ohio River and meet him at the Shawnee towns. The stage was now set for the decisive battle of what became known as Lord Dunmore’s War. Image | This entry was posted in Campaigns. Bookmark the permalink.